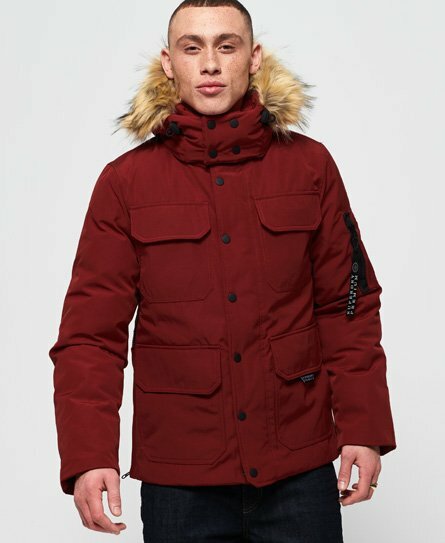 Superdry men’s premium hideout down jacket. Prepare for cooler temperatures this season wearing the roamer down jacket. This jacket has a 90/10 premium duck down fill padding to keep you warm. This jacket features a removable hood with bungee adjusters and faux fur trim, a zip and popper fastening, ribbed cuffs, four external popper pockets and one internal popper pocket. In addition, this jacket also has a zip pocket under each arm and zips in the side seams to provide comfort of sitting. For the finishing touches, this jacket has been decorated with a zip pocket on the arm, a Superdry tab on the pocket, a Superdry patch on the arm and a Superdry banded zip pull.